Whether your summer house is a beachside bungalow, a lakeside cottage, or a year-round retreat, cooking for family and friends while on vacation can be a delight—if you know how to keep it simple. 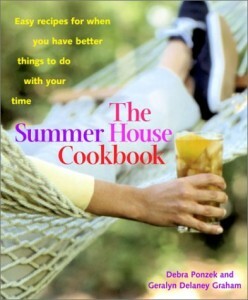 The Summer House Cookbook has all of the tips, tricks, and recipes guaranteed to make summertime cooking a breeze. Rather than stocking a vacation home with a full array of spices, whip up a couple “make-to-take” infused oils, marinades, and spice blends to bring along—they’ll give instant, effortless flavor to meats and fish. Save time in the kitchen by cleverly dressing up leftovers—turn extra roast chicken into Tarragon Tree Chicken Salad, and grilled flank steak into a great sandwich with some Balsamic-Marinated Red Onions. From crowd-pleasing recipes such as Picnic Basket Fried Chicken, Memorial Day Coleslaw, and Bar Harbor Lobster Cakes to sophisticated offerings like Charred Pesto Shrimp and Grilled Lamb Chops with Olive Butter, these dishes require nothing more than the basic equipment available in even a bare-bones kitchen. The Summer House Cookbook is filled with great ways to enjoy the pleasures of the season. Share a big pitcher of margaritas and a bowl of Best-Ever Guacamole with friends, or celebrate summer produce with Fourth of July Strawberry Shortcakes and Perfect Peach Pie. Filled with evocative photographs and the stove-side advice of two friends who love to cook together, The Summer House Cookbook is all you need to create delicious food in any kitchen. When the temperature and humidity rise, slaving over a hot stove starts to sound a lot less appealing, and home cooks might find themselves in the “summer house state of mind.” Friends and former colleagues Ponzek and Graham (the former was the executive chef of Montrachet in New York City, the latter, Montrachet’s day manager) have devised a spirited cookbook based on family summer recipes. When cooks use the freshest meats, fish and farmers’ market produce, the authors say, they’ll insure their dishes pack a flavor wallop without all kinds of preparatory fuss. Their useful kitchen tips about planning ahead, cooking double batches and transforming leftovers-“multitasking for summer minimalism,” they call it-leave more time for lounging around in the yard or on the beach. For those with an actual summer retreat, the culinary duo provides pantry lists, equipment suggestions (don’t forget the blender), and pointers on foodstuffs to bring from home (e.g., infused oils, for which they provide several recipes, add depth of flavor to quickly grilled vegetables and fillets). Though many of the recipes are speedy and delicious-such as Sea Bright Striped Bass, Cod with Oven-Roasted-Tomato Vinaigrette, Fresh Country Potato Salad, and Alsatian Frittata-not all of the recipes can be thrown together at a moment’s notice. The Fiesta Flank Steak and the Very Special French Toast both require extra effort and preparation in advance. But they’re almost uniformly pleasing, and simple recipes for tangy marinades, tasty sandwiches, refreshing beverages and seasonal salads give the home chef ways keep palates pleased during the dog days of summer.